Home Passed My Driving Test, Now What? If you have just passed the driving test, congratulations. It’s a terrific feeling to hear the examiner say ‘congratulations you have passed’. The driving test examiner will hand you your test pass certificate and you’re good to go. In terms of claiming your full driving licence, for the majority of the time this is done by the driving examiner who retains your provisional licence, sends it off to the Driver and Vehicle Licensing Agency (DVLA), who will in turn send you your full licence, usually within two weeks. Occasionally you may need to apply for a full licence yourself. Details of this can be located further down this page. I passed my driving test, now what? If you’re wanting to get driving right away, the first thing to do is of course to get yourself a car. The running costs of a car, especially for a new young driver can be expensive. The high expense is often down to the car insurance. There are some things you can do to keep the expense to a minimum. The first most important step is get the correct car. The type of car you get has a significant effect on the amount of insurance you pay, car tax and other running costs such as fuel expense. The best cars for young and new drivers guide details the most cost-efficient cars for anyone wishing to own a car. Generally speaking, go for a small car that falls within the lowest insurance and tax group possible. The lower the groups, the cheaper the car will be to tax, insure and refuel. Before getting your new car however, get some car insurance quotes. You may find the quotes you’re given a little shocking, but there are special car insurances out there for young drivers to help keeps costs down. The car insurance help guide explains the basic insurance types, including one called black box car insurance. In short, black box insurance requires your vehicle being fitted with a type of sat-nav device (the black box) which records your driving habits. This data is sent back to the insurance company where a computer algorithm assesses this data to establish whether you are a good or bad driver. If you driving is bad, your insurance will cost more. Any inadequacies found in your driving can be rectified with the help of the insurance company and the cost of your insurance can fall again. Basically, black box insurance rewards safe drivers and penalises those who aren’t. The physical skills of driving are often quickly gained by young drivers and once mastered, young drivers often feel they have a sense of immortality behind the wheel. Most prevalent among young male drivers out at night using excessive speed. Driving risk assessment takes years to master and with the false sense of security, the bravado and desire to gain thrills, young drivers who have just passed the driving test, with the lack of experience can only result in a single outcome. The majority of newly qualified drivers will have little or no experience of driving at night. Driving at night requires an extended skill set built upon those gained by driving in daylight conditions. Young drivers who drive at night are usually doing so for recreational purposes and will usually take unnecessary risks which explains the higher accident statistics for young drivers between the time of 11 pm and 5 am. Judging distances correctly at night due to reduced light and headlight glare from other vehicles can be challenging. Typically this lends itself to accident risks being increased when overtaking, merging from junctions and the inability to see cyclists and pedestrians clearly. Accident statistics once again increase with young drivers carrying passengers. The bravado attitude for young drivers attempting to impress their passengers often as a result of peer pressure will often push the driver outside of their ability to drive safely. We all know bad weather affects the ability to control a vehicle. Young drivers, especially males have a tendency to drive too harshly for a given weather condition. All of which is fine unless you need to stop or change direction. Stopping distances must be obeyed. The 2 second rule is simple to follow and must be doubled in wet conditions and multiplied by at least five when driving in ice or snow. The above are the main reasons why young drivers have accidents, although the potential for many more exist. It’s easy to understand how a young driver may have an accident due to one of the above circumstances, but often they can be a combination of many, if not all of the above circumstances, which for a driver who has very little experience and a false sense of confidence / security, clearly explains the statistics. Just a little more thought before you find yourself in a potentially dangerous situation, may not only keep you, your passengers and others that could be involved in an accident healthy, your car in good condition and your insurance premium from rising to a catastrophic financial increase, there is also your licence to think about. Drivers that have held a full driving licence for two years or more may be disqualified from driving if they build up 12 or more penalty points within a period of 3 years. New drivers that build up six or more penalty points within 2 years of passing their first driving test will automatically lose their driving licence. 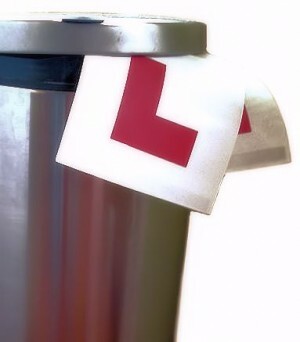 Drivers who lose their licence within two years of passing the driving test must take both the theory test and practical driving test again to obtain a full driving licence. It is however remarkably easy to accidentally gain points on a driving licence. Although not so much ‘accidentally’ as it’s often due to lacking in concentration which is especially a concern with new young drivers. With the ever increasing number of speed cameras being erected throughout towns and cities, it’s becoming increasingly easy to get caught off-guard by a camera by driving just a few mile per hour over the speed limit. Many regard speed cameras as a nuisance, though the fact remains that those few miles per hour over the speed limit you are traveling at can be the difference of life and death if you were to hit a pedestrian or cyclist. Concentration is paramount! To help concentration whilst driving, there are a few things you can do to increase this. Commentary driving is simply vocally putting into words what you see ahead of you and what you’re going to do about it. It may sound a bit daft, but it’s a highly effective method of advanced driving. It also significantly improves concentration. After a while, you will be able to do this without vocals. Emergency services such as the police use this method. Opening a window increases oxygen to the brain to aid concentration and also ensuring you are hydrated. As a new driver and especially a young new driver, you are statistically at high risk of being involved in a car accident. You cannot gain years of driving experience within a few weeks, so an understanding of the particular circumstances that young and new drivers are most at risk will enable you to minimise your chances of being involved in an accident by eliminating some of them. Here are the top ten tips for new and young drivers. 1. Once you have chosen the best cars for young and new drivers, choose a suitable insurance such as black box car insurance as this will encourage you to drive conscientiously and safely. 2. When you have passed the driving test, gain further experience by taking an advanced driving course such as the Pass Plus Scheme. Pass Plus only takes around six hours and will increase your driving skills in areas that normal driving lessons will not have covered such as motorway driving, all whether driving and night time driving. 3. Always allow plenty of time for a journey to avoid any temptation to speed. 4. Turn off your mobile phone whilst driving. Don’t be tempted to read or write a text whilst driving. Doing so will sooner or later result in an accident. 5. If you have not driven in darkness before, take an advanced driving course or take along an experienced driver with you for support and advice for your first time. You can even ask a driving instructor for a driving lesson in the dark to gain experience before you attempt to do it on your own. 6. Driving with your friends as passengers can distract your concentration from the road. Bear this in mind and concentrate on the road ahead. 7. Motorway driving is something as a learner driver you will not have experienced. Some learner drivers haven’t driven on a dual carriageway either. Take a long an experienced driver or take a lesson or two off a driving instructor before attempting dual carriageways or motorways for the first time. 8. If you are driving to a location and are unsure of the correct route, plan your route in advance. Look at a map or Google maps to gain some knowledge of the types of roads you will encounter and a to get a general idea of the directions you need. This will enable you to concentrate more on your driving. Always concentrate on your driving. 9. Still plan your route even if you intend on using a sat-nav as knowledge of what roads you will take is essential. 10. Use P plates to tell other motorists that you are an inexperienced driver. How long should you use a P plates to tell other motorists that you’re inexperienced driver? As there’s no regulation on P plates, it’s entirely up to the driver whether they do indeed wish to use them at all, and if they do, how long for. Essentially, put them on your car until you have gained in confidence. Can a new passed person take passengers? Yes an individual who has passed the driving test can take as many passengers as the vehicle you’re driving can legally carry. A sat nav will help you only in terms of directions, but it’s best to use road markings and signs primarily and plan your routes in advance as a means to find a location. The reason being is that sat navs do occasionally send you in the wrong direction. Yes you are legal to drive. No, it’s up to you if and when you drive. No restrictions. You shouldn’t need to do anything, it should simply be sent to you. Try giving the Driver and Vehicle Licensing Agency (DVLA) a call: 0300 790 6801. I have just passed road test on 19 September 2017 The examiner kept my Provisional licence and told me DVLA will send my full Licence to my address with in one week. But now I have not got it, what I should do? Call the DVLA: 0300 790 6801. They will be able to look into it for you. I appreciated your prompt reply, you have done a very good job. If I know the answers from DVLA I will let you know so others people would know as well. Hi I’ve passed my test, but need to send my provisonal license and my test certificate with a D1 form, because my address is not the same as it is on my provisional anymore. Can I still drive providing I’m sufficiently insured while I’m waiting for my full license to be sent to me? Yes, you can legally drive without issue. If you pass your driving test, the examiner will take your provisional licence (if applicable) and you will be issued a full driving licence through the post. You will be given a test pass certificate immediately after the test allowing you to drive before you receive your full licence. Hi. I pass my driving test last week. And I’v got my certificate. Egzaminer sad what I can drive with certificate. But I still can’t make incurance on my husband car because on dvla sistem shows what I still have provisional licence. What I have to do? Once the DVLA have received all the correct documentation from the DVSA (your old licence etc) the DVLA database will be updated. Should be a few days. If you’re still having problems, it would be best to call the DVLA (0300 790 6801) and explain your situation. Hello, i passed a few months ago however my instructor gave the certificate to me along with my provisional. They suggested i had to apply for my license myself which i later found out this is usually done by the instructor not the student. However i put it off for a few months and cannot find my pass certificate now, please help. Yes, this is usually done by the examiner once you have passed. They keep your provisional and give you a pass certificate. I would contact the DVLA by telephone and explain that you have lost your pass certificate. The DVLA / DVSA should hopefully have you on their system as a passed test candidate. Yes i thought that was the case but i was given my provisional back after i passed. Thankyou for your help.